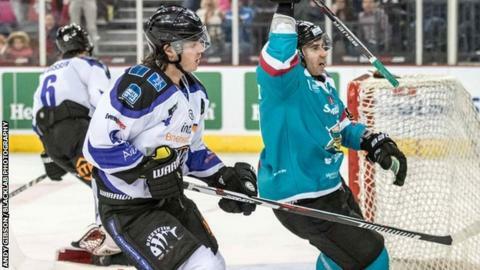 The Belfast Giants extended their winning start to the Elite League campaign to four games by beating Coventry Blaze 2-1 away from home. The Giants have now won seven games in succession in all competitions. Kris Beech scored after four minutes of the first period and Mike Radja was quickest to react to a shot off the backboards to score the second 12 minutes into the second period. Josh Godfrey pulled a goal back on the powerplay in the third period. The victory completed a successful weekend for the Giants, who saw off Braehead Clan 4-1 at the SSE Arena on Saturday night to move to the top of their Challenge Cup group. The Giants dominated the opening 20 minutes in Coventry, outshooting their hosts 20-8 and made the breakthrough early on as Beech scored with a nice backhanded finish at 4:31 after Brian Stewart Gave up a rebound on James Desmarais' initial effort. Although the visitors were unable to take further advantage of their first period dominance, the Giants penalty killing unit was in fine form, keeping the score at 1-0 going into the first intermission. The second period went much like the first and this time it was Radja who got on the scoresheet at 32:21. ,with Kevin Noble sitting in the penalty box for Roughing. The third and final period was only a few minutes old when Boris Valabik clashed with Beech which led to a scrum in the Blaze zone and saw Derrick Walser being ejected from the game.